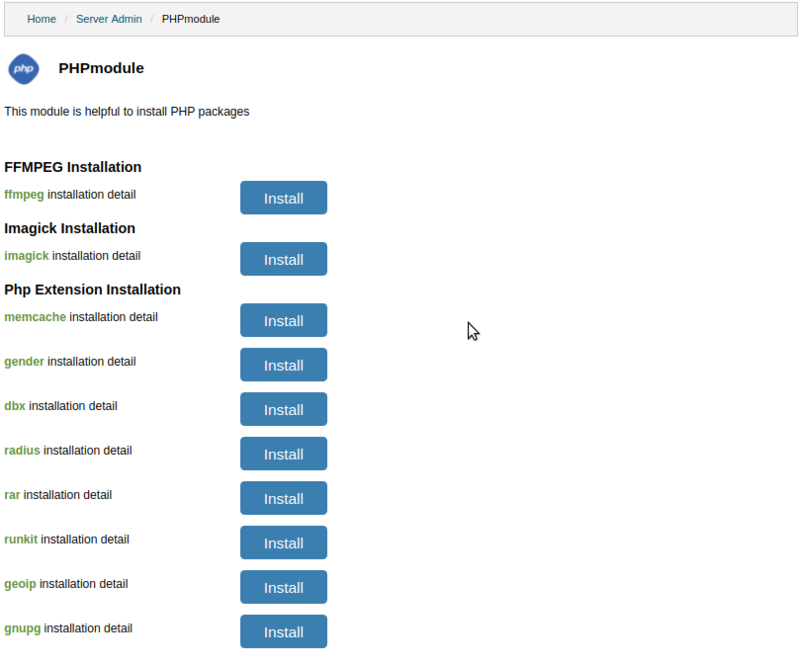 PHP module is a simple way to install all kinds of PHP hosting Plans on a server. Another important use of this module is that contains all the required code components in one place. Thus, instead of pulling code from several locations and resources, the developer has to include a single package and focus only on the implementation of the logic rather than worrying about external code resources. FFmpeg PHP is a pure OO PHP port of ffmpeg-php (written in C). It adds an easy to use, object-oriented API for accessing and retrieving information from video and audio files. It has methods for returning frames from movie files as images that can be manipulated using PHP image functions. This works well for automatically creating thumbnail images from movies. FFmpeg PHP is also useful for reporting the duration and bitrate of audio files (mp3, wma). FFmpeg PHP can access many of the video formats supported by ffmpeg (mov, avi, mpg, wmv). Imagick makes image manipulation in PHP extremely easy through an OO interface.Using SPL and other OO features supported in Imagick, it can be simple to resize all files in a directory (useful for batch resizing large digital camera images to be web viewable). It is also possible for image creation, processing, and manipulation once imagick is installed. Memcache is a distributed memory caching system. It speeds up websites hosting having large dynamic databasing by storing database object in Dynamic Memory to reduce the pressure on a server whenever an external data source requests a read. A Memcache layer reduces the number of times database requests are made. It increases the response time of your web pages, which in return enhances the overall customer’s experience. A better response time allows users to fetch data smoothly and continuously. The main purpose of gender extension is to find out the gender of first names and has a base of >40000 first names from around the world. This extension allows for definite answers (is male/female), relative results, unisex, a "couple" or, when all else fails, erroring or giving a "not found" result. It also can check for "nicknames" for common names. Dbx extension provides a database abstraction layer for the interaction with MySQL, Post-gre SQL, Microsoft SQL Server, ODBC databases in buy web space. Using this extension you can use a single set of functions to interact with any of these databases. This extension is based on the libradius (Remote Authentication Dial-In User Service) of FreeBSD. It allows clients to perform authentication and accounting by means of network requests to remote servers. This PECL extension adds full support for Radius Authentication (RFC 2865) and Radius Accounting (RFC 2866). This package is available for Unix (tested on FreeBSD and Linux) and for Windows. Rar is a powerful and effective archive which help you to read Rar archives but doesn't support writing Rar archives because this is not supported by the UnRar library and is directly prohibited by its license. The runkit extension provides means to modify constants, user-defined functions, and user-defined classes. It also provides for custom superglobal variables and embeddable sub-interpreters via sandboxing. Execute code in restricted environment(sandboxing) and also you can Replace, rename, and remove user defined functions and classes. The GeoIP extension allows you to find the location of an IP address, including the city, state, country, latitude, longitude, and other information as all, such as ISP and connection type.When GeoIP is installed you gain access to powerful, simple to use functions used to determine geographical locations of IP addresses and domain names. This is useful if you want to set a language or currency based on the country of visitors to a website. GnuPG extension allows you to encrypt and sign your data and communication, features a versatile key management system as well as access modules for all kinds of public key directories. GnuPG, also known as GPG, is a command line tool with features for easy integration with other applications. Version 2 of GnuPG also provides support for S/MIME and Secure Shell (ssh). GnuPGnuPG extension allows you to encrypt and sign your data and communication, features a versatile key management system as well as access modules for all kinds of public key directories. GnuPG, also known as GPG, is a command line tool with features for easy integration with other applications. Version 2 of GnuPG also provides support for S/MIME and Secure Shell (ssh). GnuPG extension also allows you to use the following functions: add a key for decryption/encryption, a key for signing; removes all keys which were set for decryption/encryption before, all keys which were set for signing before; decrypts/encrypts a given text; returns an array with information about all keys that matches the given pattern; toggle armored output; verifies a signed text. G extension also allows you to use the following functions: add a key for decryption/encryption, a key for signing; removes all keys which were set for decryption/encryption before, all keys which were set for signing before; decrypts/encrypts a given text; returns an array with information about all keys that matches the given pattern; toggle armored output; verifies a signed text.